Clarity is a Toronto based Yoga Teacher, Healer, and Women’s Circles Facilitator known for her sense of purpose, inspirational ceremonies and community events. 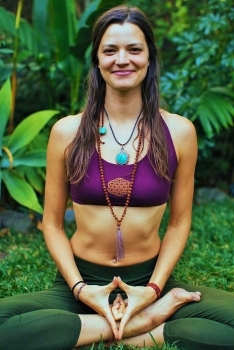 After studying traditional Hatha Yoga in India, she graduated from a Shamanic Yoga School where she adopted ceremonial practices to enrich the journeys that she guides her students and her fellow sisters through. Her goal is to open people’s hearts to the healing power of truth and love by cultivating graceful ways to connect to ourselves and others. Through years of deep inner work and study of Tantra, Clarity found transformational means to connect to her own Divine Feminine and find balance and fulfilment with her sexuality. She now hold’s space for others to do the same by sharing her knowledge and passion for the Tantric philosophy and way of life. Activate your triple Goddess energy! We will move through a yoga flow combining asanas, pranayama, mantras, and affirmations allowing you to experience the power of the Maiden, the Mother, and the Crone. A sharing circle and guided meditation helps us uncover the importance and meaning of these fundamental feminine archetypes within our lives. Learn about the intersection of Yoga and Shamanism. Practice yoga as a ritual to connect to and honor the Earth. In this class, we will uncover the importance of reclaiming a shamanic worldview to find meaning and belonging. Live instrumental sounds will accompany our shamanic Yoga journey. Connect with your sexual energy for healing and spiritual expansion. Clear sexual blockages with asanas, movements, and light self-massage. Learn to cultivate sexual energy using dynamic movements and energetic locks. Transmute your energy with Tantric breathing exercises and mantras to spread and store your life force within. Synchronizing with the energy of Kali is particularly relevant in our day and age as we are said to have entered the Age of Kali Yuga. The aim of this class is to allow participants to learn about and connect with the famous Hindu Goddess. We will be practising a warrior sequence combining asanas, pranayama and mantra in order to open ourselves to the Dark Mother’s energy.